Enjoy 7 Nights in a 2 Bedroom Suite at The Links Golf & Racquet Club in North Myrtle Beach, South Carolina! 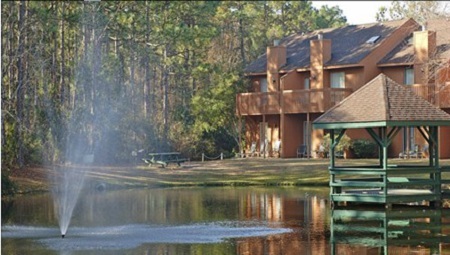 The Links Golf & Racquet Club is located on famous Myrtle Beach. Myrtle Beach is the perfect vacation gateway to the sparkling Atlantic. Whether you prefer fishing, surfing, kayaking, scuba diving, parasailing, or windsurfing, any water sport you love, you'll find that the area's crystal blue waters provide the perfect playground. Avid golfers will definitely appreciate its proximity to technically challenging and anesthetically beautiful golf courses designed by legendary golfers. Resort amenities include two tennis courts, a basketball court, freshwater fishing ponds, an Olympic-size outdoor pool, Jacuzzi, playground, picnic areas with barbecue grills and an indoor heated pool. The beach, water sports facilities, shops, live entertainment and restaurants are just minutes away from the property. The resort also has an exclusive beach cabana across from the beach and a beach shuttle service that runs in season. Myrtle Beach showcases a 60-mile stretch of soft, sandy beaches lined with water sports facilities, entertainment options, and restaurants. Sunbathing, swimming, fishing and water sports rank first among things to do. Hit the greens on some of the world's most technically challenging and anesthetically beautiful golf courses designed by legendary golfers like Arnold Palmer, Jack Nicklaus, and Greg Norman. Fine tune your forehand at the numerous tennis facilities in the vicinity. Cool off at one of the area's water or amusement parks, take a cruise aboard a riverboat, or ride a banana boat with the entire family for the thrill of a lifetime. Shopping malls, factory outlets, specialty shops, and flea markets are also close by. The Links Golf & Racquet Club features spacious, air-conditioned two-bedroom accommodations. Each unit contains a full kitchen with all the necessary appliances including a dishwasher. One bedroom has a king-size bed, second bedroom has twin beds, and the living room has a queen-size sleeper sofa. Accommodations comfortably sleep up to 6 guests and come equipped with a fireplace and a washer/dryer. Your 2 BEDROOM SUITE will sleep up to 6 and have have 3 baths,1 queen bed , 2 twin beds, and a queen sleep sofa.